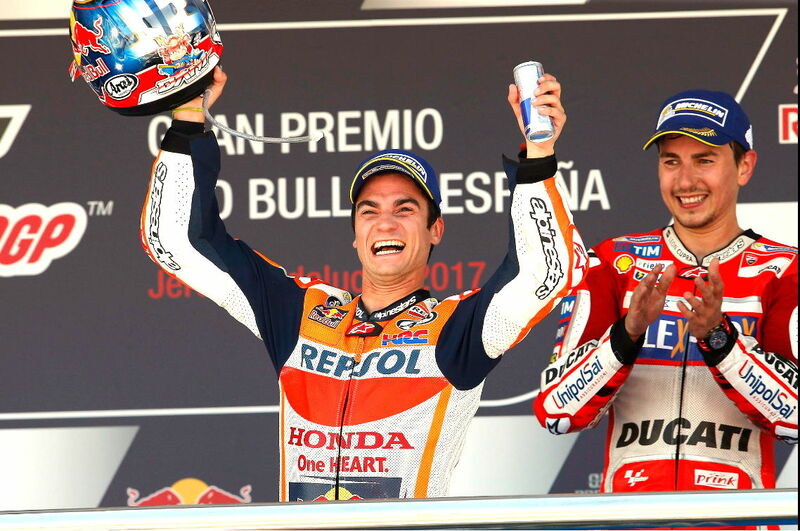 Dani Pedrosa (Honda) rode from pole position to a convincing win at the Jerez MotoGP event earlier today. Finishing second was Pedrosa’s Honda teammate Marc Marquez, with Jorge Lorenzo reaching his first podium as a Ducati Factory rider in third place. Jerez proved a difficult venue for the Yamaha Factory riders as Maverick Vinales finished sixth, and Valentino Rossi tenth. Rossi maintains a slim two point lead over Vinales in the championship, however. Follow this link to the full race results. For additional details and points, visit the official MotoGP site. I find it hard to beleive that all the Yamahas had a tougher time with tires than every other team. I think its more likely that their bike has less grunt than the other teams, so their setup favors wide open tracks better. Rossi was having a hell of a time near the end, thats for sure. To me, it looked like his fork was too stiff in all the slow speed corners and wouldn’t settle. The Yamaha has more grunt than the Honda. It drives out of corners better. Top speeds are similar, but the Hondas are known for lacking grunt compared to the Yamaha and Ducati. Called it after race at COTA, Rossi would fall back eventually. Vinales didn’t fall back like Rossi…please bring on the excuses VLJ. Rossi was up late partying, had the flu, some other silly excuse. If you predict any rider will fall back eventually, based on one poor race, well, guess what? You will eventually be proven correct. Same as when I expect you and Mickey to share the same perspective – always proven right. Huh? Sometimes we agree, some times we disagree. We are both passionate about motorcycles and motorcycle racing, but don’t always see things the same way. That sometimes makes for a spirited debate, but I don’t think either one of us has ever been disrespectul of the other. I enjoy our conversations in either case. He makes me ponder, and that’s a good thing. yea I wouldn’t write Rossi off because of one poor showing. His end of season showings are often his best and the beginning of this season was good enough to lead the championship. He has a good shot at winning it all this year. VLJ “The Yamaha has more grunt than the Honda.” Are you serious? Since when? Yamaha’s got torched this past weekend..Ask Jorge. Funnier then ***l. Loved seeing him beat the Yamahas. Pedrosa and Marquez blew everybody off, Wasn’t even close. HRC flexing it muscles right now. Sorry Honda haters. The Honda just worked better at that track on that weekend. Not sure that is HRC flexing it’s muscles. Lets see what happens over the next 12 races before we declare HRC all powerful. They certainly weren’t dominant the first 3 races. Btw Honda guy here. Everything in my garage is a Honda ….car, truck, 2 motorcycles and ATV? And they worked better at Austin too. HRC has a pretty good race record over the years. Tough outfit to beat on a regular basis. Numbers don’t lie. How did the Hondas work in Argentina? Not as well as the Yamahas worked in Spain. At least both of the Yamahas earned points in Spain. The Hondas worked pretty well in Qatar, but the Yamahas worked better there as well. Different tracks, different days, one will have an advantage over the other. Neither is all conquering. Nice to see Pedrosa smiling again, strange things happening with the Yamahas otherwise I don’t think Lorenzo would have been in the podium. zarco was the best of the Yamahas and JL beat him fair and square, on a track that didn’t historically suit the Ducatis. It would kill most people to say anything outright positive about Lorenzo. Nice to see Dani win one. But seeing Jorge in Ducati leathers sure looks mighty strange. I agree with seeing so MANY tire issues, but that is rare and to find out that the track was 14 years old and the weather changed 20 degrees put everyone in a jam… but the Honda’s have always worked better if they chose the hard tire and this race just caught many by surprise for sure. Next race please… this one was kind of boring save for Zarco pushing everyone out of the way like Marquez recreated!!! In the past when Michelin made all the GP tires they would make a special set for the team they wanted to win (Honda) the night before the race that gave that team an advantage just like what we had this time. I hope this isn’t happening now. Do you proof of this? Made tires the night before? Sounds like a legend? And when was this supposed to have happened: In the past? It was common knowledge during the days prior to the single supplier spec tire rules. Rossi was the primary recipient of those tires flown in overnight. Like most conspiracies that make no sense, it was only common knowledge amongst those lacking real knowlege. Never mentioned conspiracy. No regulation forbidding it. Simple case of tire wars and deep pockets. If belittling others helps you sleep at night, have at it. It’s a well established fact. Go look it up. Colin Edwards certainly never hides the facts surrounding the practice. ..agree with ROXX about the tires..what’s next, the bike that manages the optimum seat or gloves will have a winning advantage. There is always a dynamic about new development VS holding to standard equipment but it is annoying when the specs and tech get in the way. I blame Michelin for what should have been a closer race. When was the last time Rossi totally smoked his tires? From what I’ve read online, Rossi was mostly blaming bike setup for his woes. Obviously things were working better for the Hondas. Other thing worth noting at Jerez is that the track hasn’t been resurfaced in 14 years. Crazy! Vinales was complaining about the lack of grip on the left side of the tire, and he was much slower during the race than he’s been all year. For Rossi to finish tenth, getting passed late in the race by the likes of Petrucci, Folger, and Espargaro, after initially working his way up to fifth so quickly, it was obviously a case of his tires going off. “We struggled always very much with the spinning in acceleration. It was the main problem for all of the weekend. For the race, we try to modify the balance first of all because we were worried for the life of the medium rear. “Anyway, the hard was impossible to use. We tried to spin less. In the end it was worse. I lost feeling in the front. The race was also very difficult for braking, for entering [the corners] in all places where during practice I was better. “At the end we didn’t fix the spin and maybe we made it worse. In the end, during the last six or seven laps, especially on the left, I start to have a very high vibration and I start to slow down three seconds per lap. At the end I was lucky to arrive [at the finish]. “Sincerely speaking, I cannot speak about problems of degradation because I never had grip. I have a lot of spin also in the qualifying and I degradation arrive after ten laps. I never have a good feeling with the bike all weekend. Exactly. He never had grip. It was the tires. or maybe a combination of track surface, bike set up and tires. Not the most exciting race save for Zarco’s early charge. But is was good to see Pedrosa rock it. It was interesting to see Lorenzo perform well in a track that hasn’t been particularly friendly to the Ducati, though the result perhaps looks better than it is with both factory Yamahas failing to make any impact for one reason or another. Is this a fluke, or is Lorenzo on the move? It’s a fluke, in that his podium position was created by a rare circumstance whereby the factory Yamahas didn’t get along at all with the Michelin tires, not even at Jerez, which is traditionally a Rossi track. Also, Crutchlow crashed out, and he was clearly faster than Lorenzo. On the flipside, Lorenzo is just as clearly making real progress. He’s out-qualifying Dovi, and beating him on Sunday. #99 will be a definite threat in Le Mans to duplicate this podium finish. I agree that the podium itself is a fluke, but his riding definitely looked more “Lorenzo” than in past outings with the Ducati. Whether that is primarily driven by the home track advantage as Norm suggested or some real improvement to his understanding of the bike, I don’t know. But I look forward to finding out. Q: Is this a fluke, or is Lorenzo on the move? A: well it’s Jerez a home track. not only is it a home track, it’s a home track with one corner (T13) wearing his name. He was 6th in qualifying, and I thought – hmmm, now this is interesting. I think it’s a turning point. Lorenzo is on the move. Too good of a rider to stay down for long. It’s getting old watching riders have to “manage their tires” through the last half of every race, as opposed to exercising their talents and superhuman abilities. I get the whole “tire management” thing but it seems more constricting this year compared to previous years. Give the teams something that lasts a bit better so we get to see a more exciting product on the track! I bet it’s pretty tricky making rubber that will last long enough and still be sticky enough while having to contend with more left corners than rights or more right corners than lefts and multiple long straights with really hard braking zones, and temps over a 20 or 30 degree range. There are guys on one of forums I am on that get no more than 3,000 miles out of a set of tires before they are toast, I have seen pictures of them, balled up toast, while others with the same bike/same tires may get 10-13000 miles on them. The point being some guys are just harder on tires than other guys. Isn’t riding as fast as possible on worn-out tires without crashing a pretty clear demonstration of their “superhuman abilities”? My point is, they are NOT “riding as fast as possible”. This year, compared to previous years, tire management kicks in far earlier in races. Or could it be that some riders/bikes were able to cope with the conditions better than others? The tires will last 5,000 miles if ridden gently enough. Tire management has never not been an issue in GP racing. Looks like this track just suited the Honda a little better. Yeah but it seems it’s worse this year than previously. They go into “defense mode” halfway through the race this year. Could be. It’s easy to wonder why in a spec tire racing series that the tire manufacturer would design a tire to such a high grip/wear ratio. It’s not like Michelin has to compete with Bridgestone, or enough people are paying attention to lap records to notice a tire is 2sec/lap slower than the year before. Rubbish,. Riders choose from the tyres that have the eternal push-pull of grip verses longevity. It has ever been thus. Once or twice a season Pedrosa uncorks a ride so incredibly perfect that one wonders how he could ever lose a race. Once again the rookie Zarco looked like a threat to make the podium at the end of the race. I find him to be the real excitement now. Congrats to Pedrosa to show why he’s been a Honda GP racer for so long. A win every year for 16 is quite a consistent feat! Dani has won at least one Grand Prix every year for 16 seasons. Now he wins the 3000th Grand Prix so even without a premier class championship he has a great record. Who wants to bet that Zarco will get his first podium at Lemans? As much as I’d love to see him step foot on the podium in Le Man (French fan here), Johan hasn’t got a great track record there. Best result was 3rd in 2015. Quite entertaining to see Rossi get picked off by so many riders. We have a championship fight and it includes Dani Pedrosa. He looked great today. Ten points is all that separates the top four riders. it is entertaining, exactly my thoughts.. Perfect weekend, happy face. He deserves it. Ran a perfect race from pole to finish line, holding off a late charge by Marquez. Lorenzo on the podium. Whoda thunk it? Celebrated like he won the race lol. Guess he deserves that too, been a rough start to the season for him. Crutchlow wadded up another Honda, and Ianonne wadded up another Suzuki lol. Miller looked rather upset with Bautista. Bad weekend for the Yammies. Thought Miller might do a drop-kick ala Aaron Yates!